Written by Malcolm Muir, Jr. The 101st Airborne Division (Air Assault) has been since the 1960s the single major military force stationed–if only partially–in Tennessee. The unit boasts an illustrious combat record and is one of the U.S. Army’s most potent quick reaction forces. Formed from the Eighty-second Airborne Division on August 15, 1942, the 101st Airborne trained at Fort Bragg, North Carolina, before deploying to Great Britain in the fall of 1943. 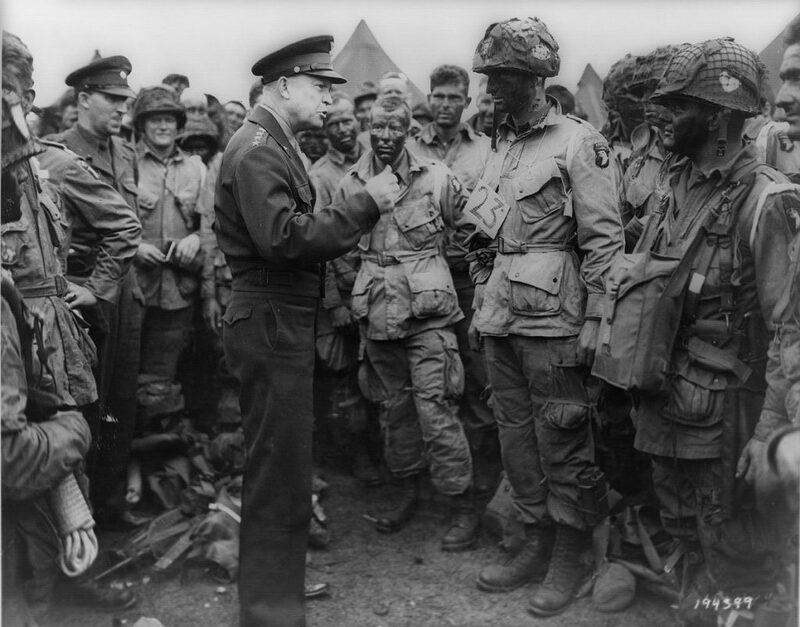 Like the other four airborne divisions in the U.S. Army in World War II, the 101st was small in numbers (about 8,400 men–half the size of a standard infantry division), but high in quality. The first combat test for the unit came during the invasion of Normandy when it parachuted behind Utah Beach on June 6, 1944. After fighting in France for a month, the 101st then took part in Operation Market Garden in September 1944. Suffering severe losses in both these engagements, the 101st was recuperating when Hitler launched his last offensive, culminating in the Battle of the Bulge. The 101st rushed forward to Bastogne, a critical road junction in Belgium. Although completely surrounded and substantially outnumbered, the paratroopers conducted so determined a resistance that the 101st received the Distinguished Unit Citation, the first such award ever made to an entire division. From February 1945 to V-E Day, the 101st fought in the Ruhr and southern Germany, ending the war at Hitler’s Berchtesgaden retreat. Inactivated in France on November 30, 1945, the 101st Airborne survived in the army for over a decade solely as a unit designator for training centers in Kentucky and later South Carolina. Then on September 21, 1956, the division’ colors moved to Fort Campbell as the unit returned to active duty. The army frequently used the division to test new equipment and operational concepts such as the pentomic organization designed so that a ground force might fight and survive on a nuclear battlefield. The 101st also was employed to suppress major civil disturbances at Little Rock in 1957, Oxford, Mississippi, in 1962, and Detroit in 1967. In 1965 part of the division (the First Brigade) deployed to Vietnam; the remainder of the unit arrived two years later. Frequently in combat, the 101st changed character as it maneuvered, principally by helicopter. Seventeen division soldiers won the Medal of Honor. In 1969 the army began the official conversion of the 101st from an airborne (parachute) to an airmobile (helicopter) formation. The division was therefore redesignated as the 101st Airborne Division (Airmobile), then as the 101st Air Cavalry Division, and finally on October 4, 1974, as the 101st Airborne Division (Air Assault). Although no longer a classic airborne formation, the unit retains a small Pathfinder element–and the title for reasons of heritage. As the Vietnam War wound down, the 101st returned to the United States; all its men were home by February 1972. Over the next decades, 101st soldiers frequently trained in NATO exercises and with Rapid Deployment forces in Egypt. Sadly in December 1985, 248 soldiers returning from Sinai duty were killed in an airplane crash at Gander, Newfoundland. The 101st next deployed abroad as a division in 1990. Participating in the early phases of Operation Desert Shield in February 1991, soldiers of the 101st fired some of the first shots of the war against Iraq when their helicopters blasted holes through the enemy radar net. As part of the XVIII Airborne Corps, the division took part in the celebrated left hook that flanked the enemy out of Kuwait. On the first day of the ground campaign, the 101st, in the single greatest air assault operation in history, sent over three hundred helicopters fifty miles into enemy territory. The 101st captured so many Iraqis that its supply of food and water had to be replenished by air dropped material. Since returning to Fort Campbell, the 101st has been held in readiness for contingency operations, although some of its troops have been deployed abroad on peacekeeping missions in places as diverse as the Middle East, Somalia, Panama, or Haiti. With a strength of over 18,000 soldiers and four hundred helicopters, the 101st Airborne (Air Assault) Division remains one of the most powerful military units in the world. As might be expected, such a large formation has a major impact on north-central Tennessee. Much of the growth of Clarksville, for instance, is directly attributable to the division’s presence at Fort Campbell.